Sanne de Wilde puts metaphors into use in her beautiful series titled Snow White. 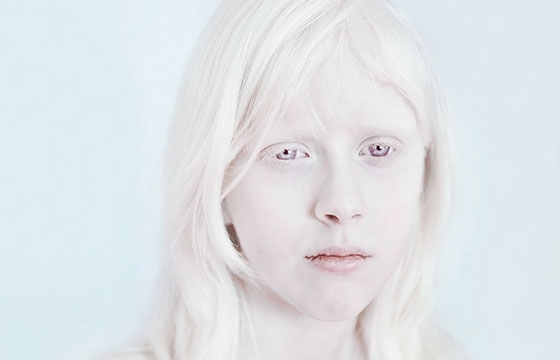 Wilde relates photographic material to people with albinism, noting that both are light sensitive. Light leaves an irreversible imprint on their body. This is the story of a Milwaukee man, an extremely talented sculptor whose works are found all over the world and who in fact is rated Number One in his genre, yet is better known in cities of Europe, Asia and The Middle East than he is right here in his own home town. His name is Marc Sijan. His Artform is Hyper Realism. With Roger Ballen on the cover of the magazine this month, we thought we would take a look back at one our favorite collaborations: Asger Carlsen and Roger Ballen. We are big fans of Asger Carlsen who we interviewed in the January 2013 issue of the magazine. The idea of the two working together seemed like such a natural fit that we were not even surprised to see it. But that doesn't mean we were any less excited to see it! Each week we feature updates on current graffiti scenes in a number of major U.S. cities with the help of a few select photographers. Ray Mock aka Carnage NYC delivers this week’s New York Scene Report. A stunning work has just been producing in Gaza by artist Iyad Sabbah, documenting and preserving the destruction of the neighborhood of Shuja’iyya during the recent conflict and the now homeless community that once lived there. 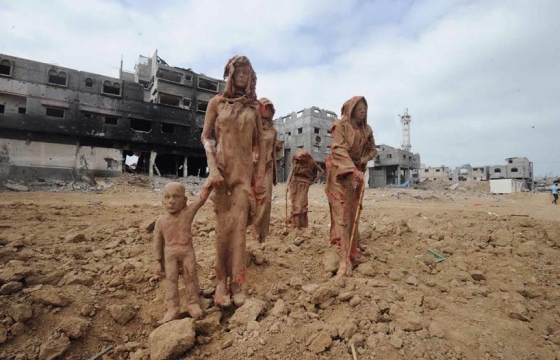 As DesignBoom points out, Sabbah "has set a family of clay figures wandering away from the war-torn wreckage. The models that comprise ‘worn out’ seem almost mummified, as if completely consumed by the death and devastation surrounding them." 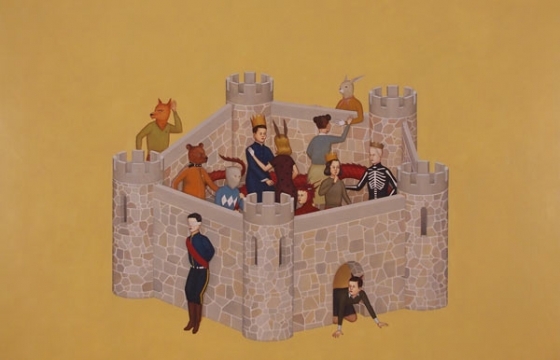 We remember seeing Edward del Rosario's work at Richard Heller Gallery a few years back, and wanted to revisit this morning. His bio is great: Edward del Rosario was born in St. Louis, Missouri. He was pushed down a flight of stairs when he was two years old. He received his BFA in Painting from the University of Kansas and his MFA in Painting and Printmaking from Rhode Island School of Design. Giuseppe Mastromatteo has been working as an artist for more than a decade. After a period spent as a recordist assistant inside a record company, Mastromatteo graduated from Accademia di Comunicazione di Milano with a degree in art direction. He writes about art, teaches advertising at various significant academic institutes, and collaborates with the Triennale Museum of Milan in the role of art director.